David: I am writing this sitting in a lively Bar in Camp Nelson with baseball on the TV because we have got a little behind on the blog. Apologies to anyone who has lost their reading on the train in the morning (Pete). Normal service is being resumed. 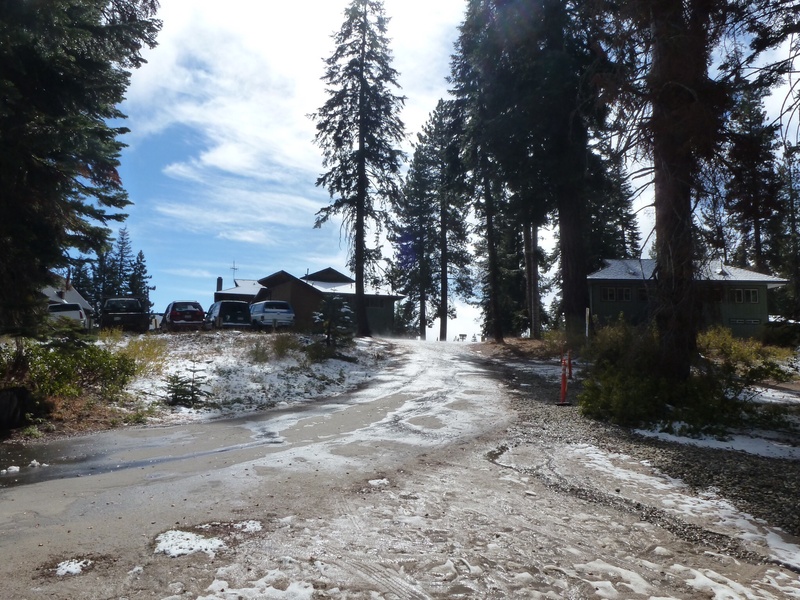 We woke at Camp Montecito and saw that the snow had come down overnight. There was a coatiing of about 2 inches on the roads, the trees and the buildings. 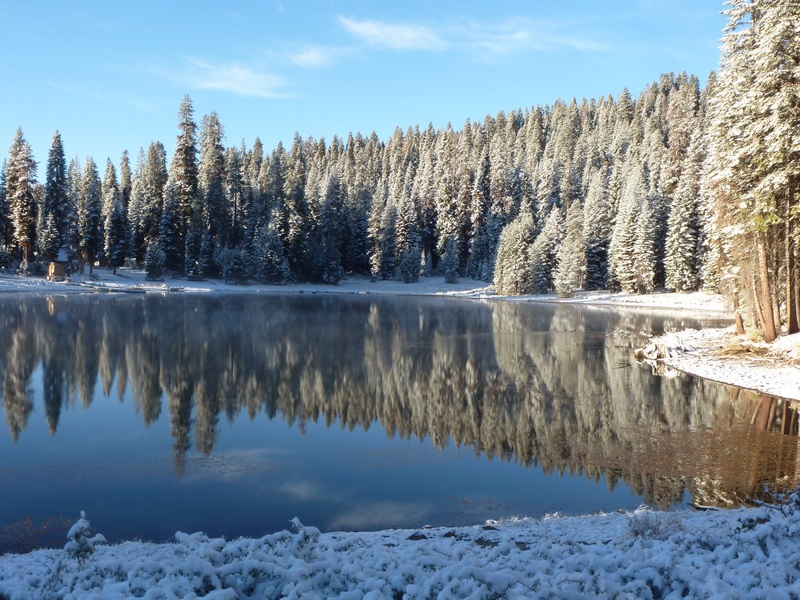 It had frozen overnight (we were at 7400 feet) and it was certainly not weather to set off on the bikes! So we ambled out and took photos of the lake and the trees. Then we ambled around, answered emails, read and enjoyed doing nothing. For those of you astonished by this statement I better repeat it – the Locks thoroughly enjoyed doing (nearly) nothing. We looked endlessly at the maps, sought advice, plotted the next few days and then changed our plans again, and then made fresh decisions! 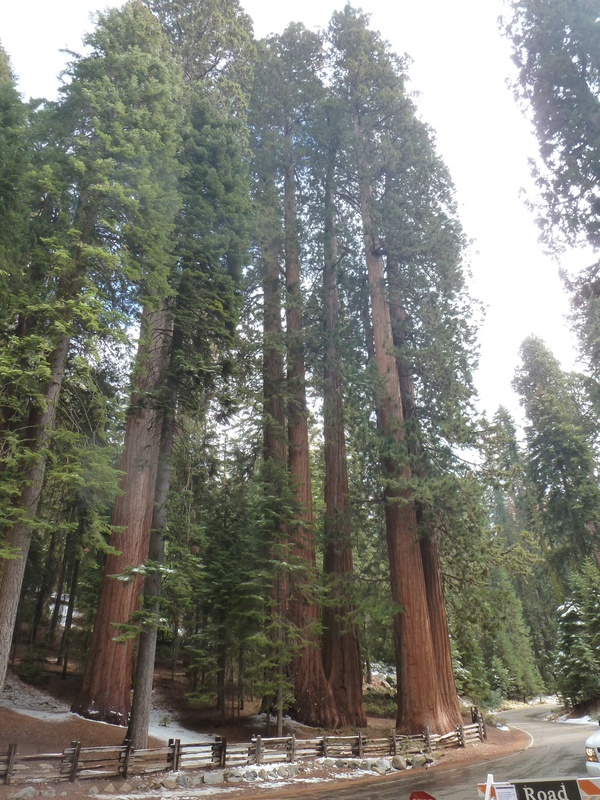 Eventually we decided to press on through Sequoia National Park. 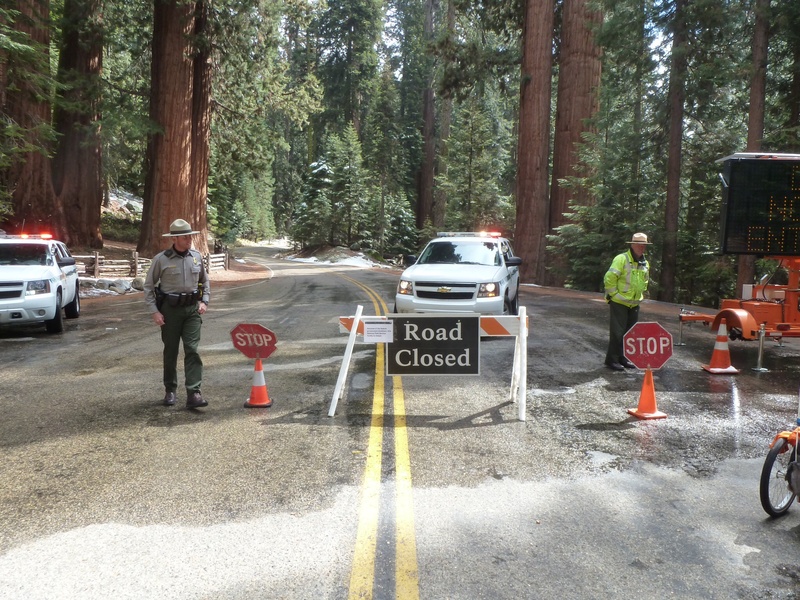 Although the National Park was closed there was no indication that the state highway that went through the park was closed. As we travelled to Monecito we were passed by various cars and so it seemed a good bet that we could get through to Three Rivers. I should however have taken more notice of the fact that I am not a betting person – and have never even bought a lottery ticket let alone placed money on horse (or a road being open). Maybe we should have made more inquiries. We got our thermals and gloves on and set out on the road going South. It was tricky to get to the main road but after that was mostly OK. There was the occasional secluded part of the road where the ice persisted but the sun was out and we made pretty good progress until we got to the entrance back into the National Park. After about a mile there was a road block and a ranger (with a gun) who told us in no uncertain terms that the road was closed. All efforts to persuade him that we should be let through to cycle down to Three Rivers fell on deaf ears. The park was closed, the road was closed and that was that! I don’t wish to give the impression he was unhelpful but he had his orders and, in the nicest possible way, made it clear that he was not going to make an exception for a couple of English cyclists. 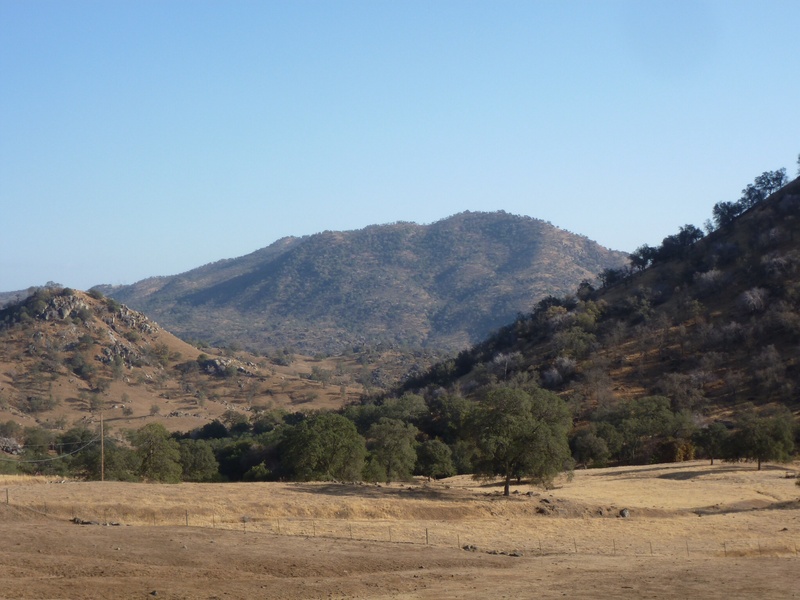 However, in a gesture that was astonshingly kind – he offered to get a pickup and take us back to teh entrance to Kings Canyon Park. That saved us several hours cycling and a 1000 foot climb. We accepted and then waited for 40 minutes whilst he was relieved by a colleague (also with a gun and a Tasar) who was equally bound by the rules! The lift took us to the entrance station we had passed (when it was unstaffed) 48 hours before. We then started to cycle (at about 3pm knowing we only had about 5 hours daylight left) and descended, passing Linn’s house but carrying on towards Badger and then down a delightful valley that seemed to carry on going down for ever. We dropped from 6400 feet to 500 feet over about 30 miles twisting, turning and stunningly beautiful valley. The change in vegetation was pretty dramatic. 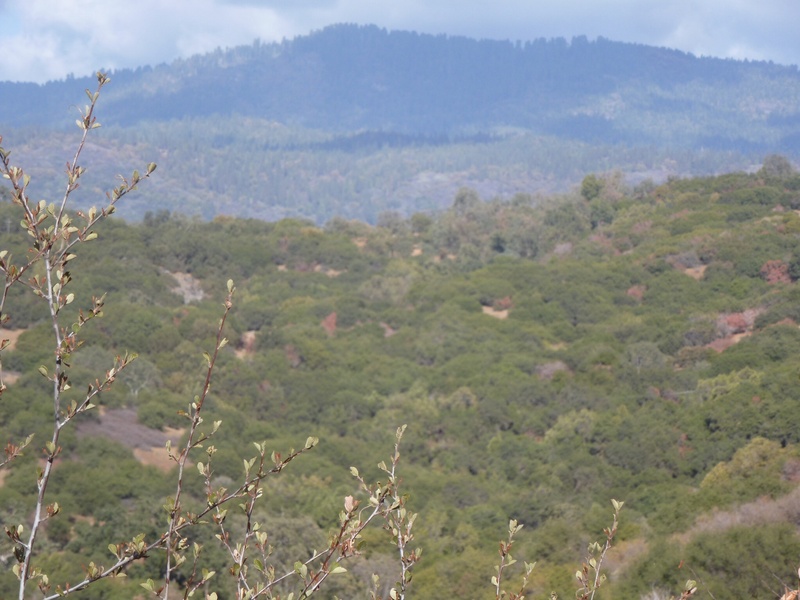 We started in woods, dropped through arid farmland and then came into irrigated citus groves. Orange and lemon trees abutted the highway and we saw our first palm trees. We had our first experience for many weeks of sustained riding on good, flat roads as we passed through this rich agricultural area, Flat riding – what a novelty. Who needs hllls when one can cover so much ground so quickly – but the views are not quite as dramatic? We got to the surprisingly large town of Woodlake by 5.30 and shopped (quickly) and then turned to the East to pick up the road below Three Rivers, finishing at Lemon Cove were there was a campsite. 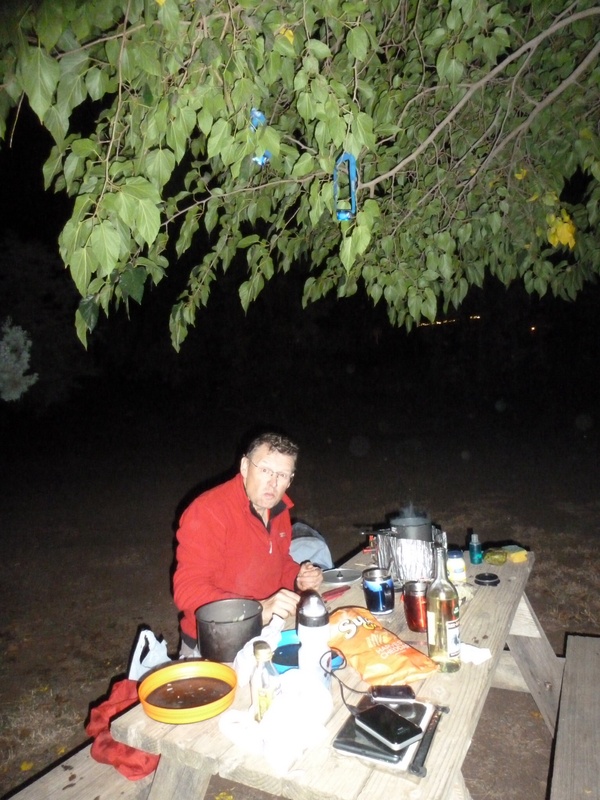 We were “back on route”, cooked supper in the gloom as we only got to the campsite at about 6.30pm and settled down for the night. Bernie: We were obviously disapointed to be turned back. We did not see the canyon or the largest living thing on earth (the General Sherman Sequoia) but it was still worth the climb in an odd sort of way. 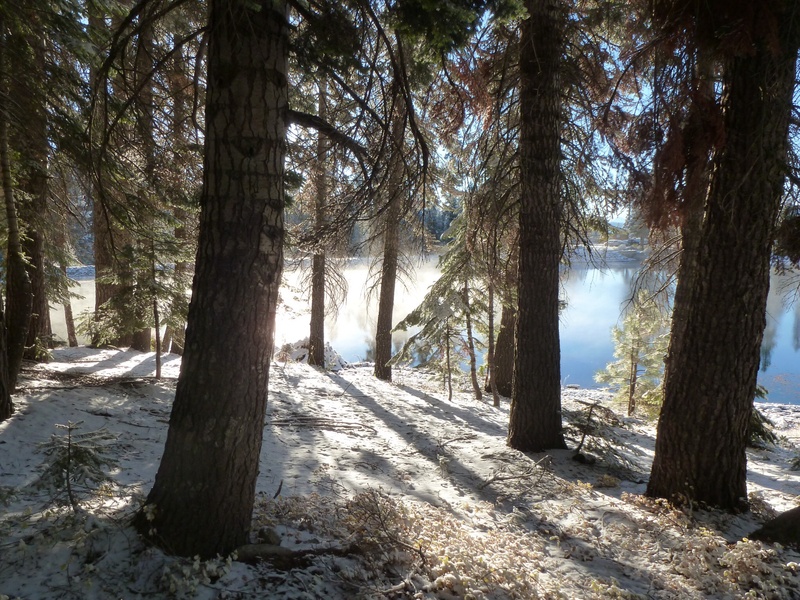 We experienced the cosiness of a warm fire after cycling in snow and the beautiful mirror lake in the followinfg morning sun, reflecting the snow covered trees, and met more nice people. The road down was amazing – passing in the space of a couple of hours from fully muffled up in thermals in snow down to palm trees and tee shirts – so as diversions go this could not have been better. Glad you had a chance to do the unthinkable – have a restful day!!! Guns and tasers – I’m glad I live here! I thought I saw you both ride by the other day. I am glad you made around ok. Good luck on the rest oft he ride.